Marsh, James H.. "Lionel Conacher". The Canadian Encyclopedia, 21 December 2018, Historica Canada. https://www.thecanadianencyclopedia.ca/en/article/lionel-conacher. Accessed 19 April 2019. Lionel Pretoria Conacher, all-round athlete, politician (born 24 May 1900 in Toronto, Ontario; died 26 May 1954 in Ottawa, Ontario). deserving of his nickname The Big Train, Conacher was the greatest all-round athlete that Canada has produced (courtesy Canada's Sports Hall of Fame). One of 10 children, Conacher grew up in a tough working-class district of Toronto. He got his first taste of sports at Jesse Ketchum School, where he went on to excel at football, lacrosse, baseball, boxing, wrestling, hockey and track and field, and won the amateur lightweight (125-lb) wrestling championship of Ontario. In 1920, in his first boxing competition, he won the Canadian light-heavyweight championship. The following year he boxed a four-round exhibition bout with Jack Dempsey, the world heavyweight champion. Conacher's power, stamina and speed (he ran 100 yards in under 10 seconds) were particularly suited to lacrosse and football. He helped the Toronto Maitlands to win the Ontario Lacrosse Association senior title in 1922. In football he was a ferocious runner and perhaps the best punter in the game. 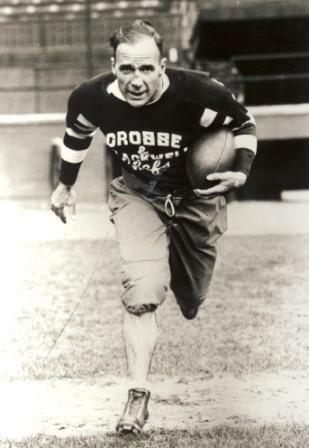 In the 1921 Grey Cup game he led the Toronto Argonauts to a 23–0 victory over the Edmonton Eskimos, scoring 15 points himself. Lionel Conacher as a football player for the Toronto Crosse and Blackwell Chefs in 1933. 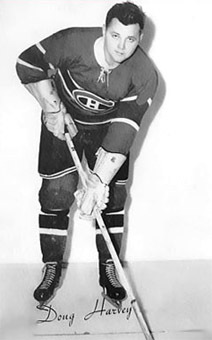 Although Conacher did not learn to skate until age 16, his aggressive, determined play made him one of the best defencemen in hockey. 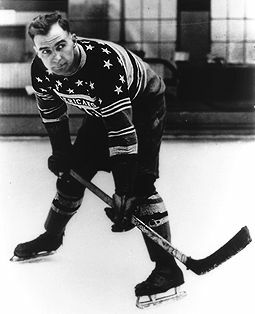 He turned professional with Pittsburgh in 1925 and played for the New York Americans, Chicago Black Hawks and Montreal Maroons (1930–33 and 1934–37). He was an NHL first all-star in 1934, and won the Stanley Cup with the Black Hawks (1934) and the Maroons (1935). Conacher entered politics in 1937 and was Liberal MPP for Toronto Bracondale. He was Ontario athletic commissioner and worked to provide recreational facilities in city parks. In 1949 he was elected federal MP for Toronto Trinity. He died of a heart attack after hitting a triple in a charity softball game. Deserving of his nickname, "The Big Train," Conacher was the greatest all-round athlete that Canada has produced. 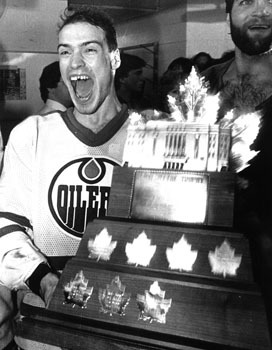 He was named Canada’s Athlete of the Half Century in 1950. 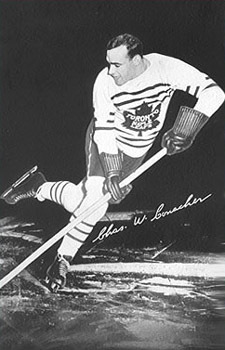 Conacher is also a member of Canada’s Sports Hall of Fame (1955), the Canadian Football Hall of Fame (1963), the Canadian Lacrosse Hall of Fame (1966) and the Hockey Hall of Fame (1994). The award for Canada’s Outstanding Male Athlete was named in his honour. Frank Cosentino, Lionel Conacher (1981).